Your purchases can make a difference. Amazon donates to Christian Ambassadors Inc when you shop at Amazon using this link: AmazonSmile. Your donations are tax-deductible to our 501(c)(3) public charity. Christian Ambassadors sponsors 3 domestic outreach programs. They are Youth Entrepreneurs Program (YEP); Professional / Personal Enhancement Program (PEP); Senior Education Program (SEP). Please click on one of the links to find out more about these programs. From 2008 to 2014 we were able to do God's work in South Africa because of the generous prayers, tithes and offerings, and donations of our supporters. Please click the link below to see how we fulfilled our mission. Christian Ambassadors Inc. has adopted the Tumaini Community Orphan School and Upendo Orphan School near Mombasa, Kenya. But as the African proverb says, "It takes a village to raise a child". We hope that you'll become a part of the "village". We also provide year-long interest-free micro-credit loans to individuals and co-ops in order to promote entreprenuership. Tumaini is a Swahili word that means “hope”. Tumaini Community Orphan School was founded in 2005 and now gives hope to nearly 200 orphans in the community. The slide show above will give you insight as to the progress. Upendo is a Swahili word that means "love". 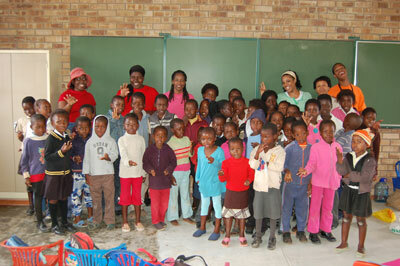 Upendo Orphan School was founded in 2007 and now gives love to nearly 25 orphans in the community. We look forward to witnessing the same type of growth at Upendo that Tumaini has experienced. All of the teachers are full-time VOLUNTEERS, as are all others who partner with them. Christian Ambassadors, Inc. personally witnessed Tumaini and Upendo in action during our trips to Kenya in 2005 - 2007. You can help support these children's needs through your prayers, and by donating Bibles, textbooks (kindergarten to grade 5), pencils, paper, backpacks, soccer uniforms, etc. (Christian Ambassadors, Inc. is a tax-exempt non-profit corporation, so your donations are tax deductible). Christian Ambassadors, Inc. has partnered with Shabnam Resources in Chennai, India. We hope that you'll become a partner also. and we'll pick them up and forward them to Shabnam Resources (Christian Ambassadors, Inc. is tax-exempt non-profit corporation, so your donations are tax deductible). He and his wife are full-time VOLUNTEERS, as are all others who partner with them. Christian Ambassadors, Inc. personally witnessed Shabnam Resources in action during our trip to India in 2004. Christian Ambassadors, Inc. supports the great work that Legacy Institute is doing in Chang Mai, Thailand. Leon and Gloria Sexton are full-time VOLUNTEERS, as are all of the teachers and those who provide administrative support for Legacy Institute. Christian Ambassadors, Inc. personally witnessed Legacy Institute in action during our trip to Thailand in 2002.